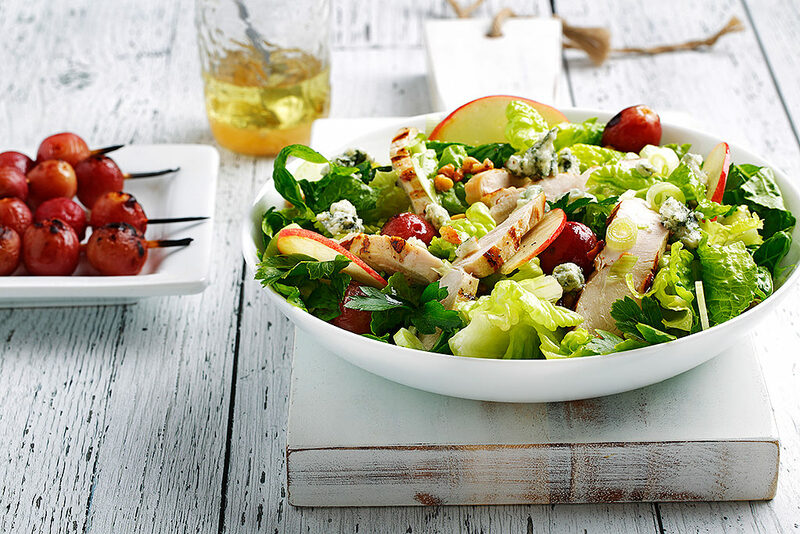 Named after the Waldorf-Astoria Hotel in New York, where it was first served, this salad is a take on an original Waldorf by adding sweet barbecued grapes. To speed up cooking time of the chicken, butterfly the breasts by slicing the breasts horizontally from the round side inward. Not a fan of blue cheese? Try crumbling feta on top. If using bamboo skewers, soak in water for at least 30 minutes before grilling. Preheat barbecue to 300°F (150°C). In a large bowl, combine lettuce, onions, celery, apple and parsley. Toss and set aside. Using 4 skewers, thread enough grapes to fill the skewer and lightly spray with canola cooking spray. Set aside. On a cutting board, butterfly breasts by placing one hand on top of the chicken breast (keeping your fingers tucked upward for safety). Slice chicken breast horizontally, cutting almost through to the other side. Repeat with other chicken breast. Open chicken breasts like a book, spray with canola cooking spray and season with salt and pepper. When grill reaches temperature place a grill mat on one side of the barbecue grill. Place grape skewers on mat. 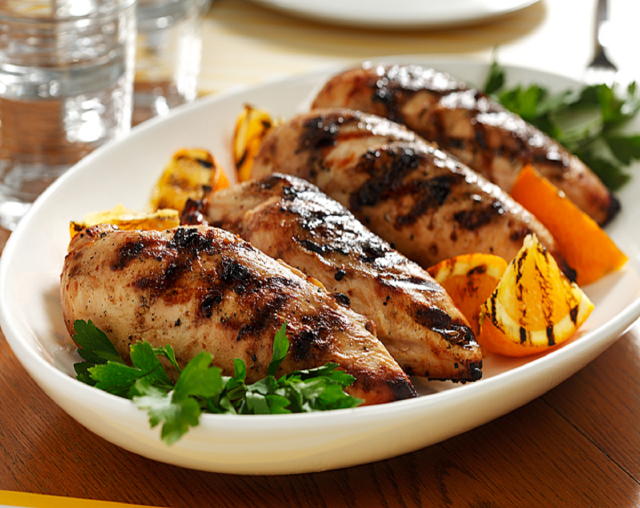 On the other side of the grill, place butterflied chicken breasts. Cook grapes for 5-7 minutes or until grapes appear brown and have caramelized. Cook chicken for 3-5 minutes each side or until both sides have char grill marks and is cooked through. Remove from grill cover and rest chicken for 10 minutes. Finish chicken by slicing into strips. In a medium sized frying pan over medium-high heat, toast walnuts for 5-7 minutes until brown and fragrant. Toss often being careful not to burn. In a small bowl or jar with a lid, combine dressing ingredients and whisk or shake to combine. Toss salad with dressing and portion into bowls. Remove grapes from skewers and add to each dish. Top with cheese, toasted walnuts and chicken strips.